Touch Chromebook. Acer's Chromebook convertible offers an IPS touchscreen, a silent operation, and long battery runtimes. ARM technology is used inside. The whole package costs approximately 400 Euros (~$425). Positive: Solid workmanship; silent system; nice touchscreen; comfortable keyboard; long battery life. Negative: Low performance; only 64GB ROM. Model: The Acer Chromebook 13 series returns with many options and longest lasting Chromebook yet, while old Chromebooks typically had a poor multitasking performance. Compared to laptops, Chromebooks are made for web-based tasks and excel in it in term of productivity. This new Chromebook is simple and the stylish exterior makes it look stunning in terms of its design and it can easily fit in backpacks. 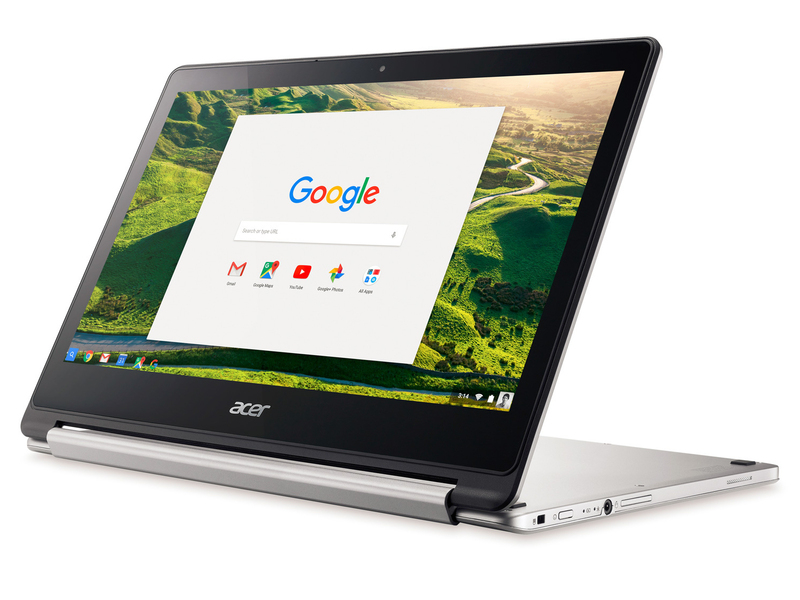 The simplicity of the Acer Chromebook R13 CB5-312T-K0YK enables its user to not worry about its configurations as it can be easily set up without needing much of a technical know-how. This particular Chromebook uses a Mediatek MT8173C processor, 4096 MB of RAM and 32 GB eMMC flash memory. The R13 CB5-312T-K0YK comes with a 13.3-inch display with a resolution of 1,920 x 1,080 pixels, a pixel density of 157 PPI, an aspect ratio of 16:9. It supports 10-point input and an active stylus. The Chromebook uses the PowerVR GX6250 graphics with a core clock of 700 MHz for handling all your daily needs while browsing the web. The Acer Chromebook R13 CB5-312T-K0YK is a good Chromebook with sharp screen, absolutely killer battery lifetime, and a comfy keyboard. With sharp screen display and impressive wide viewing angles, users can see clearly at any angle it is titled. The Acer Chromebook R13 CB5-312T-K0YK is also flexible enough to be used as a tablet with touchscreen feature because it is easy to twist. The hinge makes the Chromebook sturdy in stationary position and does not wobble. At 1.5 kg (3.31 lb) and 32.77 x 22.86 x 1.8 cm (12.9 x 9 x 0.71 inch), the Acer Chromebook 13 is a good choice for a lightweight laptop that can last all day without recharging. Compared to typical Chromebooks, the battery life is longest. The battery runtime is the best feature offered by this particular Chromebook. The casing is made from metal and matte white plastic and is refreshingly minimalist. The aluminum use on the Chromebook does not affect the robustness. The Acer and Google Chrome logos are located on the left side of the lid. The tapered bottom contributes to a sleek look. The base unit can be dented. Even when pressure is applied to the lid, it is not easy to break. Towards the front, on the left and right of the of the computer the speaker’s ports are located. There is USB 3.0 port together with the SD card reader on the left side of the notebook, while the headphone or microphone is one the right. On the back of the laptop, there are an additional USB 3.0 port and an HDMI port. By far, the Acer Chromebook R13 CB5-312T-K0YK packed a lot of improvements from the previous versions and is undoubtedly the best Chromebook by Acer yet.